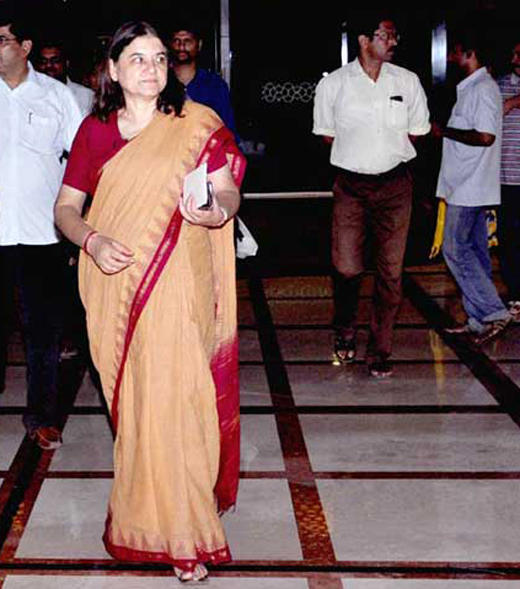 Sullia, April 5, 2015: Union Minister for Women and Child Development Maneka Gandhi who has expressed grave concern over the rise in the illegal abattoirs in the nation, has also stressed the need for a ban on cow slaughter all over the nation. Speaking to media men at a guest house at Subrahmanya where she had arrived to offer pooja at the Kukke Subrahmanya Temple on April 5, Sunday, Maneka Gandhi said animals continue to be slaughtered in the nation and added that even the tiger population in the nation is on a downward trend. The Minister also informed that a special child protection unit will be operative under the joint aegis of the Child Development and Railway Ministries to rescue children who wander aimlessly in railway stations after escaping from houses where they work as domestic helps. She also said there has been a rise in cases of missing and kidnapping of children. There is a need to rehabilitate such children as otherwise they may be misused for unlawful activities, the minister said. Such units will function in over 300 railway stations across the country very soon, Maneka informed. She also spoke about the various measures taken by her department to check harassment of children. However, the minister refused to comment on the racist comments made against Congress Chief Sonia Gandhi by Union Minister Giriraj. Maneka Gandhi later offered special pooja at Kukke Subrahmanya Temple. Basavaraj, Assistant Commissioner of Puttur, Srinivas Shetty, Tahsildar of Sullia and others were present.